Contains all the well known features of Pour-N-Walk™ with higher chemical and acid resistance . 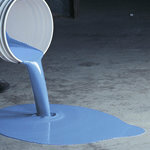 Pour-N-Walk™ CR is a self leveling and a trowel free installation. Just mix and pour for easy squeegee application. @ 70F: light traffic: 10-18 hours. Premeasured 5 gal kit for easy application; Components Include: 1 gal Part A (resin), 1/2 gal Part B (hardener), 15 lbs Part C (aggregate) - volumes and weight approximate. Pour-N-Walk™ CR is approved for shipping to all 50 states by ground or air.